14:1 These are the inheritances that the people of Israel received in the land of Canaan, which Eleazar the priest and Joshua the son of Nun and the heads of the fathers' houses of the tribes of the people of Israel gave them to inherit. 2 Their inheritance was by lot, just as the Lord had commanded by the hand of Moses for the nine and one-half tribes. 3 For Moses had given an inheritance to the two and one-half tribes beyond the Jordan, but to the Levites he gave no inheritance among them. 4 For the people of Joseph were two tribes, Manasseh and Ephraim. And no portion was given to the Levites in the land, but only cities to dwell in, with their pasturelands for their livestock and their substance. 5 The people of Israel did as the Lord commanded Moses; they allotted the land. 13:8With whom the Reubenites and the Gadites have received their inheritance, which Moses gave them, beyond Jordan eastward, even as Moses the servant of the LORD gave them; 13:9From Aroer, that is upon the bank of the river Arnon, and the city that is in the midst of the river, and all the plain of Medeba unto Dibon; 13:10And all the cities of Sihon king of the Amorites, which reigned in Heshbon, unto the border of the children of Ammon; 13:11And Gilead, and the border of the Geshurites and Maachathites, and all mount Hermon, and all Bashan unto Salcah; 13:12All the kingdom of Og in Bashan, which reigned in Ashtaroth and in Edrei, who remained of the remnant of the giants: for these did Moses smite, and cast them out. 13:13Nevertheless the children of Israel expelled not the Geshurites, nor the Maachathites: but the Geshurites and the Maachathites dwell among the Israelites until this day. 13:14Only unto the tribe of Levi he gave none inheritance; the sacrifices of the LORD God of Israel made by fire are their inheritance, as he said unto them. 13:15And Moses gave unto the tribe of the children of Reuben inheritance according to their families. 13:16And their coast was from Aroer, that is on the bank of the river Arnon, and the city that is in the midst of the river, and all the plain by Medeba; 13:17Heshbon, and all her cities that are in the plain; Dibon, and Bamothbaal, and Bethbaalmeon, 13:18And Jahaza, and Kedemoth, and Mephaath, 13:19And Kirjathaim, and Sibmah, and Zarethshahar in the mount of the valley, 13:20And Bethpeor, and Ashdothpisgah, and Bethjeshimoth, 13:21And all the cities of the plain, and all the kingdom of Sihon king of the Amorites, which reigned in Heshbon, whom Moses smote with the princes of Midian, Evi, and Rekem, and Zur, and Hur, and Reba, which were dukes of Sihon, dwelling in the country. 13:22Balaam also the son of Beor, the soothsayer, did the children of Israel slay with the sword among them that were slain by them. 13:23And the border of the children of Reuben was Jordan, and the border thereof. This was the inheritance of the children of Reuben after their families, the cities and the villages thereof. 13:24And Moses gave inheritance unto the tribe of Gad, even unto the children of Gad according to their families. 13:25And their coast was Jazer, and all the cities of Gilead, and half the land of the children of Ammon, unto Aroer that is before Rabbah; 13:26And from Heshbon unto Ramathmizpeh, and Betonim; and from Mahanaim unto the border of Debir; 13:27And in the valley, Betharam, and Bethnimrah, and Succoth, and Zaphon, the rest of the kingdom of Sihon king of Heshbon, Jordan and his border, even unto the edge of the sea of Chinnereth on the other side Jordan eastward. 13:28This is the inheritance of the children of Gad after their families, the cities, and their villages. 13:29And Moses gave inheritance unto the half tribe of Manasseh: and this was the possession of the half tribe of the children of Manasseh by their families. 13:30And their coast was from Mahanaim, all Bashan, all the kingdom of Og king of Bashan, and all the towns of Jair, which are in Bashan, threescore cities: 13:31And half Gilead, and Ashtaroth, and Edrei, cities of the kingdom of Og in Bashan, were pertaining unto the children of Machir the son of Manasseh, even to the one half of the children of Machir by their families. 13:32These are the countries which Moses did distribute for inheritance in the plains of Moab, on the other side Jordan, by Jericho, eastward. 13:33But unto the tribe of Levi Moses gave not any inheritance: the LORD God of Israel was their inheritance, as he said unto them. 14:1And these are the countries which the children of Israel inherited in the land of Canaan, which Eleazar the priest, and Joshua the son of Nun, and the heads of the fathers of the tribes of the children of Israel, distributed for inheritance to them.14:2By lot was their inheritance, as the LORD commanded by the hand of Moses, for the nine tribes, and for the half tribe.14:3For Moses had given the inheritance of two tribes and an half tribe on the other side Jordan: but unto the Levites he gave none inheritance among them.14:4For the children of Joseph were two tribes, Manasseh and Ephraim: therefore they gave no part unto the Levites in the land, save cities to dwell in, with their suburbs for their cattle and for their substance.14:5As the LORD commanded Moses, so the children of Israel did, and they divided the land. 14And when they were come to the multitude, there came to him a certain man, kneeling down to him, and saying,15Lord, have mercy on my son: for he is a lunatic, and sore vexed: for ofttimes he falleth into the fire, and oft into the water.16And I brought him to thy disciples, and they could not cure him.17Then Jesus answered and said, O faithless and perverse generation, how long shall I be with you? how long shall I suffer you? bring him hither to me.18And Jesus rebuked the devil; and he departed out of him: and the child was cured from that very hour.19Then came the disciples to Jesus apart, and said, Why could not we cast him out?20And Jesus said unto them, Because of your unbelief: for verily I say unto you, If ye have faith as a grain of mustard seed, ye shall say unto this mountain, Remove hence to yonder place; and it shall remove; and nothing shall be impossible unto you.21Howbeit this kind goeth not out but by prayer and fasting. 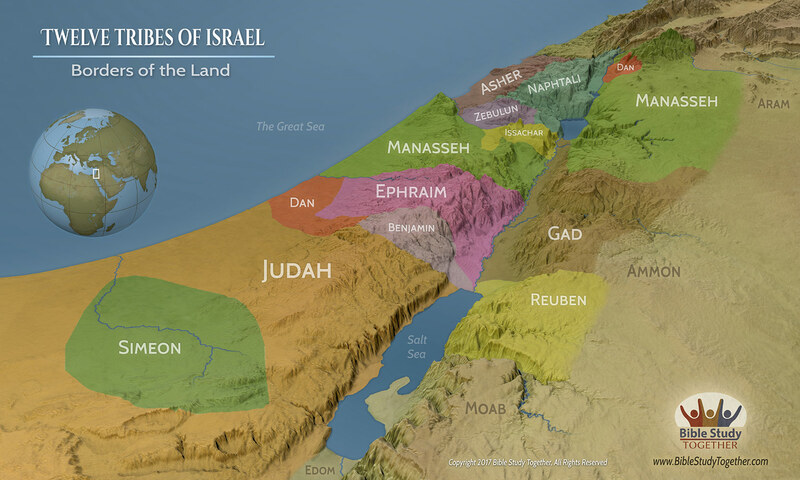 How is the inheritance of the Levites different from the other tribes? Based on Matthew’s account how would you describe a twisted and faithless generation? How does today’s account work together with yesterday’s account to give us insight on how to work miracles? How have you seen faith and prayer accomplish mighty things in your life? Talk to another believer about what helps them grow in faith.